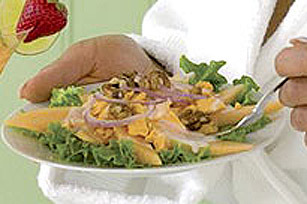 Try a bistro-style salad for one, made with fresh cantaloupe, sharp cheddar cheese and a creamy vinaigrette made with Italian dressing and yogurt. It's the perfect quick lunch or light dinner. Slice 1/8 of a cantaloupe into thin wedges and arrange on lettuce-lined plate. Top with 2 Tbsp. crumbled MacLaren's Imperial Sharp Cold Pack Cheddar Cheese. Mix 1 Tbsp. vanilla low fat yogurt and 1 Tbsp. Kraft Calorie-Wise Italian Dressing; drizzle over salad. Sprinkle with toasted walnut pieces and red onion slivers. Serve immediately. Substitute any other seasonal melon for cantaloupe.